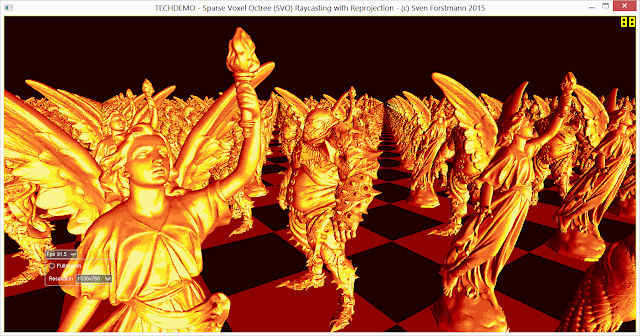 I decided to release a tech demo of the sparse voxel octree raytracing re-projection algorithm. Feel free to download and try it out. It uses OpenCL and should run on NVIDIA in any case. For ATI and INTEL HD I cannot guarantee. The algorithm raycasts only a fraction of pixels for each screen. Most are re-used from the previous frame exploiting frame-to-frame coherency, which allows a speed up of up to 4x. 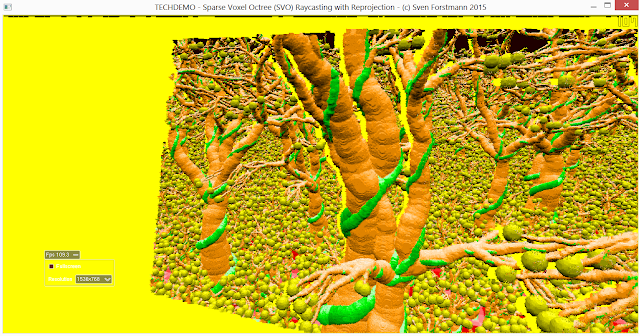 The algorithm is explained here: http://voxels.blogspot.com/2014/05/rayc ... image.html.